All time entries can be exported to an (.XLS) format to use with your spreadsheet program. You have two options: export timesheets for payroll or export reports for client billing / project costing / productivity, etc. The file link will be sent to your e-mail address or you can refresh the page and download it from the timesheets page after 1 minute. By default the Excel file has two tabs. A summary (overview) and “All Time Entries” which is a list of all IN/OUT entries for all team members. On 8 August, I have an IN entry at 07:48am, the total activity time duration for this IN is registered as 16 hours and 11 minutes (from 07:48am until 12.00am midnight). On 9 August, the unfinished IN is registered as PREV IN with the same registration time as the original (07:48am). The total activity time duration for this action is 8 hours and 49 minutes as I clocked in again at 8:49am (from 12am midnight, until 08:49am). The generated timesheet will be in in Microsoft Excel (.XLS) format which can be used with most spreadsheet programs including Apple's Numbers and Google Sheets which are free to use. Download an example timesheet Excel file. Filters - You can filter out any member name, activities or clients (if applicable). Subgroup - Same as the above, this gives you a separate column next to the first group. 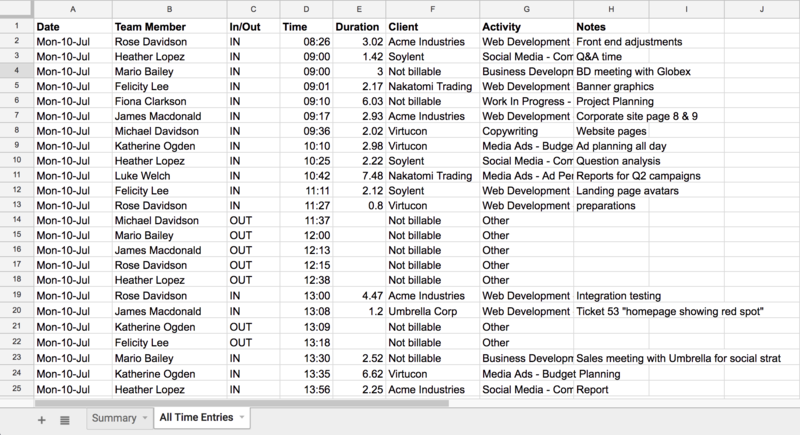 Column B gives you the list of clients that your team has worked on for those activities (subgroup). You can always decide to remove the subgroup by leaving it blank when downloading the file. Download an example report Excel file. Note: you can change the time format from decimal to HH:MM by changing your user settings. You can learn more about that in this help article.